Working with limited space, an architect duo has managed to create an eclectic ambience, that too with a liberal use of recycled and reused materials. Architects Lester Rozario and Smruti Kamat came together to set up the firm of Kamat & Rozario Architecture in Bangalore, specifically driven by a passion to follow uncharted paths. 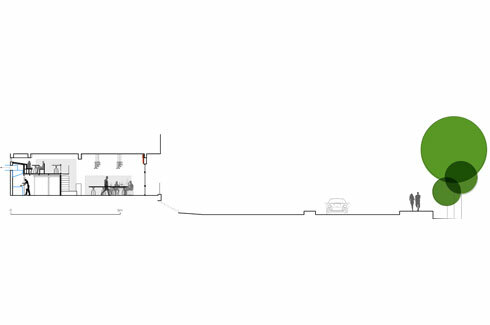 The architecture initiative set up in 2007 is the result of two young minds choosing to go by their creative instincts instead of relying on tried and tested design formulae and styles to define their body of work. Lester Rozario pursued his degree in architecture from MS Ramaiah Institute of Technology, for which he bagged a gold medal. Smruti Kamat, on the other hand, is an alumnus of Kamla Raheja Institute for Architecture, Mumbai, and has a Master’s degree in architecture from Virginia Tech, USA. 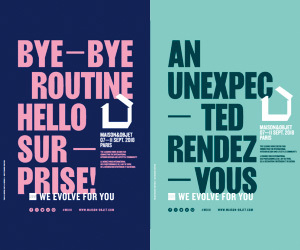 Both Lester and Smruti started out in their careers working for reputed architects before a like-minded approach toward design and creativity helped kick start their own venture. The combination of the triangles used in the staircase and a handrail with suspended glass is a hallmark of ingenuity and creative use of materials. Ask them what is the one driving factor for their sense of aesthetics, and they reply in unison, “Nothing is set in stone. 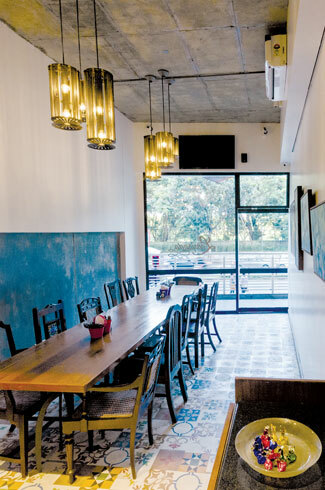 We usually follow a design process and go wherever it takes us.” Driven by this philosophy, Lester and Smruti took on the project to design a restaurant named Lemirado in Bangalore and gave the place an unimaginable face-lift despite working with a constrained space. 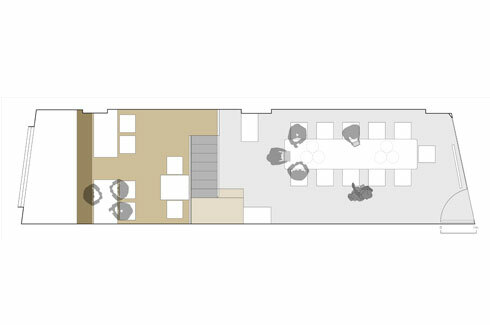 Measuring 3.3m x 11.8m, the restaurant site was considerably small and narrow. 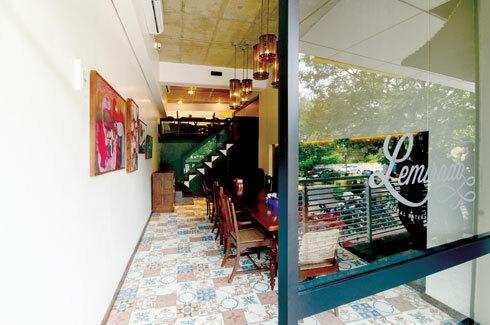 The idea was to give it a feel of a global eatery with a casual setting and an eclectic menu. The location of the restaurant, which has an extremely cosmopolitan feel to it despite being in an old part of town, played a crucial role in helping the designers evolve a distinct theme. Another prominent feature of Lemirado is the unique shape given to the staircase. 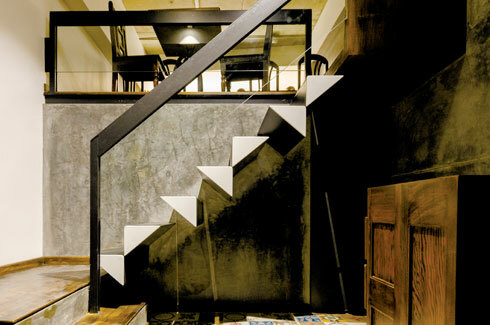 The juxtaposition of triangles used for the staircase lends the interiors an edgy and chic appeal. 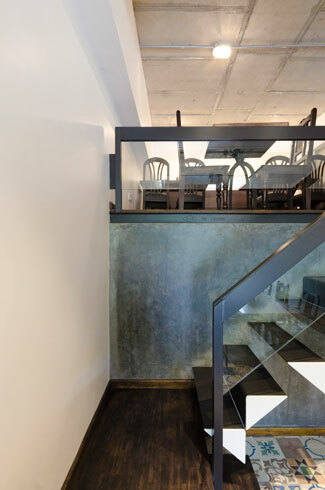 The designers, too, agree that the staircase was one of their favourite parts of this design initiative. “The staircase, thought of as a sculptural element, is simply a jumble of triangles. For reasons of safety there needed to be a handrail. The challenge was to create a handrail which is free of the steps so that it did not disturb the composition of triangles. In order to achieve this, we developed a handrail wherein the glass is suspended from an MS frame. It was an interesting exercise and a definite favourite,” says Smruti. If one has to pick one design element that makes Lemirado a fine example of creativity, it has to be the liberal use of recycled and reused materials. “As a part of the design process, we sought to consciously recycle and reuse, and see what interesting features this would result in. All the furniture in the space is made out of teak wood, salvaged from old furniture owned by the client,” she adds. Therefore, the wooden boards forming the table tops have no uniform size or pattern. 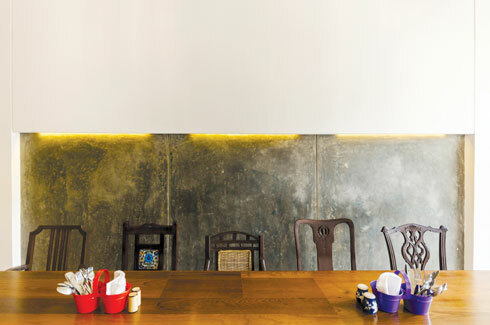 The dissimilar chairs are also recycled and retrofitted, in keeping with the eclectic theme of the eatery. 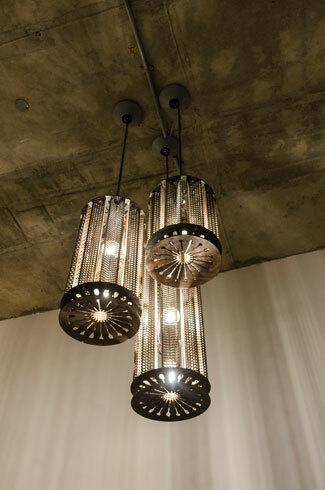 The hanging lamps were designed from old truck clutch plates sourced from the local metal scrap market. The plates were beautiful objects in themselves, so the design of the hanging lamps was spun around them. The lamps were an exciting experiment for them and went through a number of iterations, where each step taught them something new, in working with metal.